Allows attack speed effects to stack, enables attack speed debuffs, and a MCM to set your own base attack speed. Unofficial Skyrim Legendary Edition Patch Not technically required. However there are some attack speed fixes in USLEEP that I won't duplicate. Weather Does Things While you can technically run Weather Does Things without the Attack Speed Fix, you'll find the attack speed debuff won't work. Added MCM to allow setting your own attack speed base for the player and NPCs. Got rid of keywords and keyword checks, as they were unnecessary. Changed the way NPCs get the fix from a cloak with a script effect to a cloak that applies the fix directly as MGEFs. Got rid of a script that has been made obsolete by this release. Added Brawl Bugs Patch scripts (credits to jonwd7). Brawl bug testing before was flawed because Brawl Bugs Patch scripts from Skyrim Redone were present and it was assumed nothing but vanilla was in the testing environment. Conditions checks made slightly more robust by checking for the magic effect instead of the spell. There was a very rare case where this was important. Both files cleaned with TES5Edit. Cleanup and new samples. consolidated left and right attack speed into one spell. Renamed everything in the mod to have the ASM prefix. Added 1 alchemy and 1 enchantment based buff to the sample spells file. Optimization. Cloak's application script was previously run every second for every actor. Now it only runs once and never again. Removed unnecessary cloak conditions, as the Brawl Bug does not occur even if the cloak stays on. Removed the off-switch as it is no longer necessary. Disabling the mod fully removes everything added. 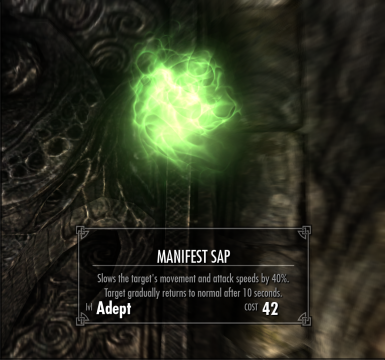 Attack Speed Framework corrects an attack speed flaw in vanilla Skyrim. It allows attack speed effects to be stacked properly and makes attack speed debuffs possible. In addition, versions 3.0 and later provide a MCM that lets you set the base attack speed for yourself and for NPCs. Combat too fast or too slow? Now you can fight at the speed you've always wanted. The way attack speed was handled in vanilla Skyrim is flawed. Normal attack speed can be achieved with a weaponspeedmult of 1, 0, or any negative number. 150% attack speed is 1.5 and 50% attack speed is 0.5. 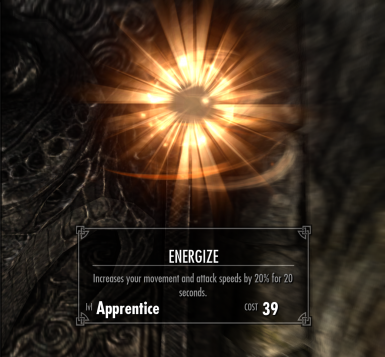 Vanilla Skyrim starts all characters with a value of 0 and then adds 1+x to give the character an x% attack speed boost. The problem with this method is that attack speed is not properly stackable. If you take Dual Flurry perk you'd get +1.2. If you also gained some ability from another mod that gave +15% attack speed, you'd get another +1.15. This would resilt in 235% attack speed instead of the 135% you'd expect. This design also makes debuffs impossible to manage since adding 0.80 to achieve a 20% speed loss could have the opposite result in the presence of any other attack speed effects. ASF fixes these problems. It is primarily a framework to encourage compatibility between mods that modify attack speed. With ASF, all mods can stack their attack speed effects without conflicts. You don't need ASF if you have installed one of the following mods, as they contain their own version of the fix. However you may still want ASF for the ability to set your own base attack speeds. Compatibility problems with these mods can be resolved in-game, usually through the MCM or console. TheThirdRace Skill Overhaul (TTRSO): see this thread if you use the One-Handed, Illusion, Light Armor or Speech modules. The full-featured version is the latest version. However there are some people who want to minimize scripts and/or dependencies in their game. In the ASF 2.2 Races version there are no active scripts. The spell is simply added to all vanilla races. This version also does not require SKSE or SkyUI. However this version doesn't fix custom races and doesn't allow you to set your own base attack speeds. It will also conflict with mods that edit the vanilla races. Mod Organizer or NMM are the recommended installation methods. However if you want to install manually, simply extract the archive to your Data folder. This mod has soft incompatibilities with the mods on the Substitute List because they do the same thing. By soft incompatibilities I mean that they are easily fixable. Most of these mods allow you to turn their attack speed fix off in their MCM. This mod will have hard incompatibilities with any mod that modifies attack speed using the old vanilla method. 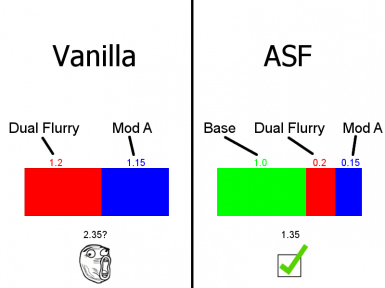 If you notice some unexpectedly fast attacks, and can identify which mod is using the old method, you should first contact the mod author and ask them to update their mod based on the ASF guide in the downloads section. I'd also like to know about it so I can add it to my list of hard incompatibilities. If the mod author doesn't fix it, you can fix the incompatibility yourself in TES5Edit or the Creation Kit by finding attack speed modifiers with a value greater than 1, and subtracting 1 from those modifiers. I will NOT be making patches for other people's mods. Ordinator The temporary attack speed effects are implemented using the vanilla style. You may be able to just avoid using these temporary AS effects. Vigor - Combat and Injuries is currently incompatible with ASF 3.0 and higher for an unknown reason. However ASF 2.2 is compatible. I've contacted the author to see if we can figure out a solution. True Hybrid - Tainted Blood of the Dragonborn Enhanced Hybrid form will make your attack speed too high because it's a vanilla style effect. - If you change NPC base attack speeds you will have to change location before those changes take effect. The easiest way to do this is to enter or exit an interior. This only needs to be done once each time you change NPC attack speed. For most people this means once per character. - Unarmed (fist) attacks aren't affected by this mod. This is because weaponspeedmult, the actor value that is modified, doesn't affect unarmed attack speed. - The game engine interprets both zero and negative attack speed values as normal attack speed, so if you debuff a character too much, the debuffs will appear to have no effect. I have not found away to fix this with just ASF's framework. ASF simply corrects the base attack speed value to be 1.0 for the player and all NPCs, and adjusts the perks that modify attack speed to add 1-x, where x is the previous value, to compensate for this change. To distribute this effect to NPCs in the Main Version, the player gets an invisible cloak that applies it to surrounding NPCs. There is very minimal scripting to achieve this. In particular, there are no continuous polling scripts. In the older 2.2 Races version the spell is simply added to all vanilla races. Check out the ASF guide in the downloads section. It would also be great if you make me aware of any ASF-like implementations so I can update the Substitute List. Credits to jonwd7 for the Brawl Bugs Patch and EnaiSaion for the newer Modern Brawl Bugs Fix. These mods prevent the harmless cloak spells that make this mod work from being considered cheating in brawls. Lastly, HUGE thanks to Mattiewagg! She provided tremendous help in resolving bugs in the latest version of the mod, saving me countless hours. Check out her mods, they're all amazing! I especially like Fighting Fatigue.